A section of slatwork and a raised lower chair rail contribute to a supportive back in the Amish Centennial Mission Bar Stool. Let the simple beauty of mission style furniture contribute to your kitchen furniture collection. These stationary bar stools are the solution to casual dinners at the counter. Sit up at your kitchen island when the kids are out for the evening and save yourself the time of setting the dinner table for two. 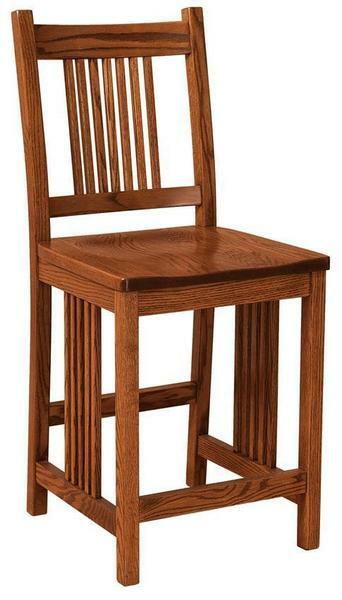 Bar stool seating takes to your kitchen scene with versatility and solid wood comfort. The Centennial is available in a swivel bar stool option or a dining chair as well. Create your version of the Centennial Mission Bar Stool. Pick a 24" counter height or 30" bar height. If you prefer an upholstered bar stool, browse our collection of fine fabrics and leathers. Nine quality hardwoods are available for these mission bar stools, all sourced here in America. Rustic woods with open or filled knots are also options to consider. Seat Height from Back: 17 3/4"